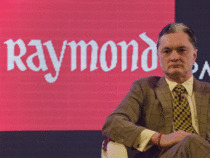 NEW DELHI: Shares of RaymondNSE -0.92 %, a leading fashion and textile retailer, rose over 3 per cent on Wednesday after the company announced the setting up of a new division called ‘Raymond Realty’ for its maiden venture into the real estate sector. The scrip surged over 3 per cent to hit a high of Rs 843.90. Later, the scrip was hovering at Rs 834.45, up 2.21 per cent at 12:39 pm. This was against 0.33 per cent rise in the BSE Sensex. “With central theme of ‘Go Beyond’, the company has undertaken the project to build quality housingNSE -1.21 % for all. A large gated community named ‘Aspirational District’ is spread over 14 acres that celebrates a new epoch in living,” the company said in a BSE filing. Earlier in the day, the stock opened at Rs 831.05 on BSE against its previous closing of Rs 816.40. The shares of the company closed 0.96 per cent down at Rs 808.55 on BSE.